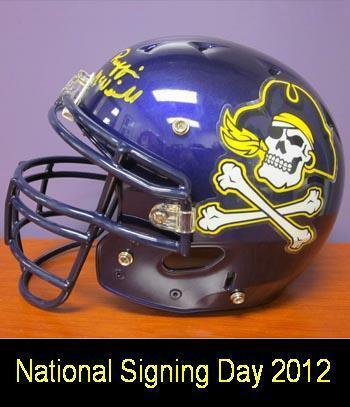 In years past, the final few weeks before the National Signing Day – this year, February 1st – has been largely unremarkable for the Pirates. Discussion usually would focus on a couple of topics: 1) will a kid bail on us last minute? 2) will the kids we got be able to get into school? This year, however, there is a different smell in the air. One that oozes higher risk, higher rewards. In recent interviews with Coach K, Lincoln Riley, and Brian Mitchell, as well as with the (not anywhere as big anymore) big man, Coach Ruff, each man said that this year’s class was shaping up to be an historic one for the Pirates and so far, it sure does seem that way as we have landed some big verbals already and are seemingly in the running for a few more “Wow” type announcements. Sure…we have had previous self-hyped classes, but this year, all indicators are that the smoke we are hearing truly does have a fire source, starting with the Lucas Thompson commitment on National TV. The coaches were pretty specific, too, as to the why and how of this class, noting that UNC has pending NCAA sanctions coming that should leave that program in shambles for the duration of any of this year’s recruits careers, N.C. State had to deal with some heavy rumors about Tom O’Brien’s future and Duke and Wake coming off of bleh seasons. Also, it was noted that this staff has done a great job of getting out and about and playing up the realities of the AQ and BCS status – meaning that just because a team is in an AQ conference, history shows us that ECU has about as good a chance to get to a BCS game as pretty much every team except a handful of top-feeders in each AQ conference and even a stronger likelihood of going bowling each year than many of the AQ teams. So as we approach February 1st things are starting to get a little saucier. First, we awaken to the word this morning that quarterback Kanler Coker has dropped the Pirates and switched to the Tar Heels. A bit of shocker to me, but I am relieved it was the QB rather than any of the position guys we need to be ready sooner rather than later. Lincoln will certainly find another quarterback with potential for our offense and he will do it easier than we will find, say, a quality offensive lineman or defensive lineman. Second, we have the good fortune to be getting late visits from a veritable buffet of talented players across a bunch of needed positions during the final weeks leading up to signing day. If we get just half of the guys on the list who are visiting in the final weeks here, we are going to, indeed, have a very noteworthy class from both the needs and wow-factor perspectives. Taking a look at the young men who have visited or will visit in the next two weeks, there are some big-time OLs, LBs, and Athletes coming in. Getting the Amos commitment this weekend was a great get and more important that the Coker one, IMO. If we can land Jamal Marcus or Keilin Rayner at LB and Jonathon McLaughlin or Mark Glowinski (JC) at Offensive Tackle and Jela Duncan or Imani Cross at Running Back, then we will be well positioned to continue to grow a bigger time program than we have been in years from a recruiting standpoint. Double up on any of those and it is even sweeter. Personally, if we double up, I would most prefer to get the two OLs, followed by the LBs, then the RBs, but that is my preference (I love to fortify the trenches). Each of those names above, and more, are making/or have made a January stop in Greenville which bodes well for us because official visits are a big deal. There is a reason these kids are burning one of their five trips on ECU…we are a serious consideration for each of them. We all know that being last and having the opportunity to show these kids inside the program at ECU is always a big, big benefit for our recruiting because the kids leave feeling that special difference that is ECU. Will we get any of them? Who knows? Will it be a tough call for any that visit? Definitely. And, what’s more, is that there are compelling reasons why these big fish might come to ECU. Look at Lucas Thompson. I would imagine the first and foremost factor is that he very well could be a four-year guy in this program…that is big…huge…for a player who wants to see days in the NFL. Same opportunity could be said for the running backs coming in and for the OLs. Harder path for the LBs, but if they are as lights out as they appear, then they could get in there early too. The other item, which should not be lost on their egos, is that at ECU, the bonafide rock stars are the football players…period. And finally, there is the path to the NFL. 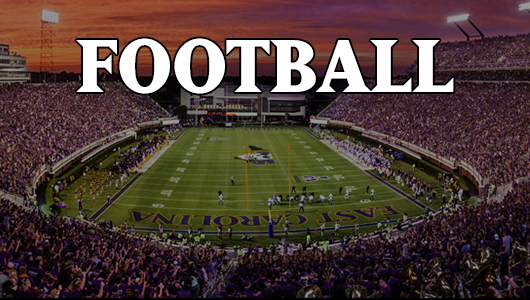 More and more, with not only the players were are putting in the NFL, but the quality of the players we are putting in the NFL, our recruiting staff can show that ECU offers not only a direct path to the League, but one that is going to be a blast for those who choose to do it. Considering that two recent ECU grads are multi-year NFL Pro-Bowlers at Tailback and Fullback in Chris Johnson and Vonta Leach, but also we have 2011 Super Bowl champion CJ Wilson and 2012 SB hopeful Linval Joseph, all current NFL stars. This class is shaping up to be a sign of the future, IMO, for ECU. If the AQ status falls as many predict in 2014, then our competition for top players will pretty much level save the very top, big name schools and we no longer will have to hear about AQ status from teams that have a far less likelihood of going bowling and winning any kind of championship (e.g., Duke, Carolina, Wake, State) as well as having to lose players to bottom feeders in the other AQ conferences. And, we will be able to underscore bot the early playing time, the different lifestyle in Greenville, and the path to the NFL being, arguably, easier for the top notch players who won’t run into having to risk being a second-teamer to another prep all-America at the schools like Alabama, Texas, and USC. I cannot wait till February 1st to see who will actually be part of what might become an historic recruiting class for this program. The future looks bright for the 2012 season! Hi Chuck…Thanks for dropping in and posting! Indeed, the future does look bright. Hopefully, we are done with the injury bugs that have so impacted the team in 2010 and last season. You have to think that with a “normal” injury count in 2012, we should be able to convert a few more close ones into victory. And, oh yeah, I am excited to see what Trent does this season in his battle for the punting job! Just tell him no jammed fingers…we need his hands as much as his foot. A good holder is earns the FG/PAT as much as the PK (underrated, but soooo important)! Well done sir! I agree that the recruiting is on the upswing here at ECU and in my opinion has a great deal to do with Coach Ruff. I also believe that our best recruiting years are still ahead of us. This program is on the rise and convincing these young recruits to come along for the time of their lives will be the hardest part. But, with Ruff at the wheel…that shouldn’t be very difficult! Thanks for checking in Mr. Ghost! I am a huge proponent of the one factor that Ruff certainly looks for in his recruits: Guys who want to be Pirates. A different breed for sure and why we have always done more with so much less than some of our sister institutions who seemingly do so much less with so much more. Happily, my prediction about Lucas Thompson (on an earlier post) was dead wrong. I’m sure glad he signed. What is your final assessment of the overall class now that they are all signed? You know…I had the same feeling on Thompson, so I share your “happy-to-have-been” wrong sentiment. I am happy with the caliber of athletes we signed. Not sure how I feel about 1/3 of the class being JUCOs and I wish we could have signed at least one more OL along with a RB and another QB. Defensively, if the rumors are true that Dontrill Hyman will be here by Fall from Hinds (and all indicators are that the rumors are true) then I think that the defensive focus in this class on LBs and DBs was dead on. I have a bunch more to say, but I am putting it together in a post which I hope to get out tomorrow. I think that this class is one of the better ones we have had in a while. We missed on a good group who had us as finalized, but despite not signing any of them, it shows we are making headway by getting on the shortlists for these exceptional athletes. Of course, now…the question is how many make it to campus?? Also hearing there could be a few late pickups.